If you are tired of wearing out traditional red rubber Multi-Purpose hoses, Ortac is a heavy duty solution rather than going to a yellow air hose. 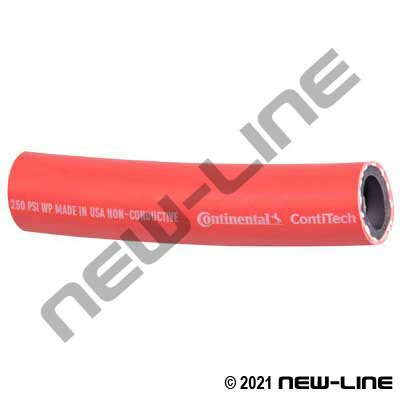 NL1363 Goodyear Ortac is a high quality, highly abrasion resistant, red general service hose recommended for air or water (not food grade) as well as petroleum in non-critical applications where static conductivity is not required. Its cover and tube are manufactured with maximum oil-resistant rubber compounds (RMA Class A). This hose can be found in demanding applications in factories, construction, quarries, mines, shipbuilding, and other abusive environments. Its tough cover resists oils, solvents, weathering, ozone, and heavy abrasion. The minimum electrical resistance is greater than 1 megohm per inch of hose length at 1000V DC. Construction: Tube: Black, nitrile rubber. Cover: Red, Carbryn rubber. Reinforcement: Spiral synthetic yarn. Detail Comments: For other sizes please see our NL3260 Goodyear Redwing Fuel Delivery.